On Friday, 20 April 2012, I attended a luncheon hosted by the Council on Foreign Relations in Montreal at which Canada’s Citizenship and Immigration Minister, the Honourable Jason Kenney, announced two major changes coming to Canada’s Citizenship legislation. The luncheon’s start was delayed by close to half an hour by so-called “immigrant rights” protesters who tried to prevent it from taking place. Some of them attempted to storm the entrance way and intimidate attendees, but they were held back by security. Others managed to find their way into the dining hall and were said to have overturnrd some tables but they were removed. Now the first change announced by Minister Kenney involves language competency. At present, individuals seeking Canadian Citizenship are supposed to have an adequate knowledge of either English or French but this requirement has been applied in an inconsistent manner. According to Mr Kenney, he is often confronted with examples of individuals who have lived many years in Canada and who have become Citizens even though their skills in either language are so poor that they cannot carry on a simple conversation. The Minister stated that he finds this situation unacceptable. Under the proposed amendments to the Citizenship Regulations, which govern the implementation of Canada’s Citizenship Act, prospective Citizens would be required to provide objective evidence of their language ability with their applications. They could do so by submitting a variety of objective evidence, including the results of approved third-party tests, evidence of completion of secondary or post-secondary education in English or French, or evidence of successfully reaching a set level of proficiency in certain government funded language training programs. “The proposed change would encourage Citizenship applicants to ensure that they can speak English or French when they apply,” Minister Kenney said. “Language is an important component of the successful integration of immigrants and new Citizens.” Inability to communicate in one of Canada’s two main languages is a major barrier to social mobility and integration, he added. The author shares the Minister’s concerns but notes that there are already long delays for persons to obtain language testing in permanent residency files. With the added demand of language testing for Citizenship applications, waiting times are sure to increase and testing agencies will be tempted to raise their prices. 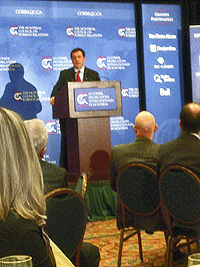 Another important issue addressed by Minister Kenney at the luncheon came in reply to a question from the audience. The Minister confirmed that it will be his intention to require physical presence in Canada as the only way for an individual to amass the required number of residency days for Citizenship. This will prove to be an important reform of the law. Under the present system, an individual is required to establish that he or she has resided in Canada for at least 3 years out of the 4 years dating back from their Citizenship application. However, the legislation does not define what constitutes “residency”. Some Citizenship Judges require physical presence in Canada and some do not. For example, some Judges have said it is sufficient for an individual to have “centralized” his or her life in Canada (for example by maintaining a residence and presence of a spouse and children in Canada), even though the applicant himself might work outside the country. Although an applicant can appeal from the Citizenship Court to the Federal Court, different Judges therein also have divergent views so confusion and lack of consistency reigns supreme. The Minister did not indicate whether he intends to maintain the present 3 years out of 4 years as the benchmark, or whether there might be an easier test, such as 3 out of 5 years. It is hoped that the Minister will tie the residency reform in the Citizenship Act to measures to standardize what does and does not count as proof of residency, because there are divergent views among Citizenship Judges on that issue right now as well. For example, in one decision I read recently the Citizenship Court rejected an application because the candidate could not prove to the Judge’s satisfaction that he had worked in Canada. However, his passport showed quite clearly from various visa stamps that he appeared to have met the strict physical presence test of 3 years out of 4 in Canada. It would also be advisable for the Minister to make arrangements with his colleague, Minister of Public Safety, the Honourable Vic Toews, who is in charge of the Canada Border Services Agency, to ensure that border agents stamp the (foreign) passport of permanent residents every time they return to Canada to help ensure accuracy in assessing Citizenship applications down the road. Now some border agents do not bother to stamp the passports and I have had clients inform me that border agents have refused even when asked to do so. The Minister stated that he plans to introduce these changes by the end of 2012. A few weeks ago he announced his intention to require that the tradition of persons acquiring Citizenship by simple birth in Canada even when neither parent is a Citizen. These will be major changes and the details remain to be worked out. It is also be interesting to see whether the changes will be applied with retroactive effect to applications already in the system. For professional guidance on these matters and assistance for your Citizenship file you are invited to contact us at the Fogarty Law Firm. It is ironic that these modern day self-styled defenders of human rights who tried to disrupt this event believe that freedom of speech protected in the Canadian Charter of Rights and Freedoms guarantees that right for themselves only and not for others with differing viewpoints. They would be advised to go back to the library and learn some basic rules of democracy since they almost seem to be guided only by strong-arm tactics and bullying.